When it comes to fall cooking, polenta is a staple in our house. This comforting dish has cold-weather/dark nights written all over it. Best of all, this isn’t just an ordinary polenta. 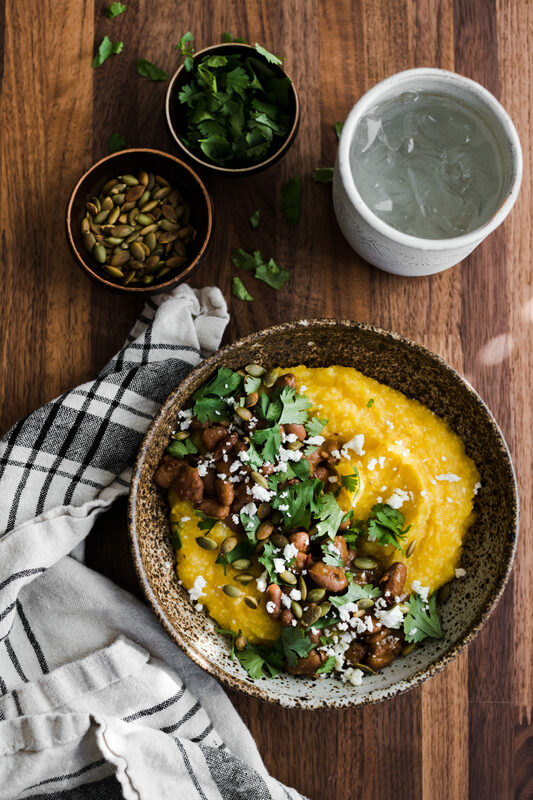 Rather, it’s a creamy pumpkin polenta using freshly roasted pumpkins. Sure, you can buy the canned pumpkin but I don’t think you’ve experienced all fall has to offer until you roast a pumpkin. The flavor and texture is a bit different from the canned counterpart. I find the flavor to be a bit more mellow and the texture to be not as thick. For this reason, I cook this pumpkin polenta version a bit more firm than I normally would and then add the pumpkin. Another option, use millet in place of the polenta. This is one of my favorite tricks for people who try to avoid corn. Millet is a seed that, when cracked, has similar properties as polenta. The millet cooks up creamy and can even be cooled, cut, and fried the next day. In terms of beans, cook them at home. I love dried pinto beans that are cooked with a sizable helping of onions, garlic, and herbs. Cooking them at home sets the second round of cooking, with the chipotle, even more tasty. Don’t have pinto beans? Swap them for black beans. Both work well with the flavors in the polenta and they both make for a gorgeous final plating. If you happen to have leftovers, I recommend you store them separately, primarily for the benefit of the polenta. To reheat the polenta, warm on low in a small pot or heat in the microwave. Heat the beans in a similar fashion and combine like you would in the recipe. Preheat oven to 400˚F. Slice the pumpkin in half and place cut-side down in a roasting pan. Place in the oven and bake until the pumpkin is soft, 40 to 50 minutes. Remove from the oven, scoop out the seeds, and measure out about 1 ½ cups of the pumpkin. Bring the vegetable broth and water to a boil in a medium pot. Add in the polenta, whisking until the mixture begins to thicken. Reduce the heat to a simmer, cover, and let cook for 25 to 30 minutes, stirring occasionally. (full technique can be found here). Once the polenta is done, add in the pumpkin, stirring well to combine. While both the pumpkin and polenta are cooking, heat a small pan or skillet over medium-low heat. Add the olive oil along with the minced garlic. Cook for a minute, until fragrant. Measure in the pinto beans with liquid, chipotle, cumin, and salt. Cook until the beans are warm and most of the liquid is gone. 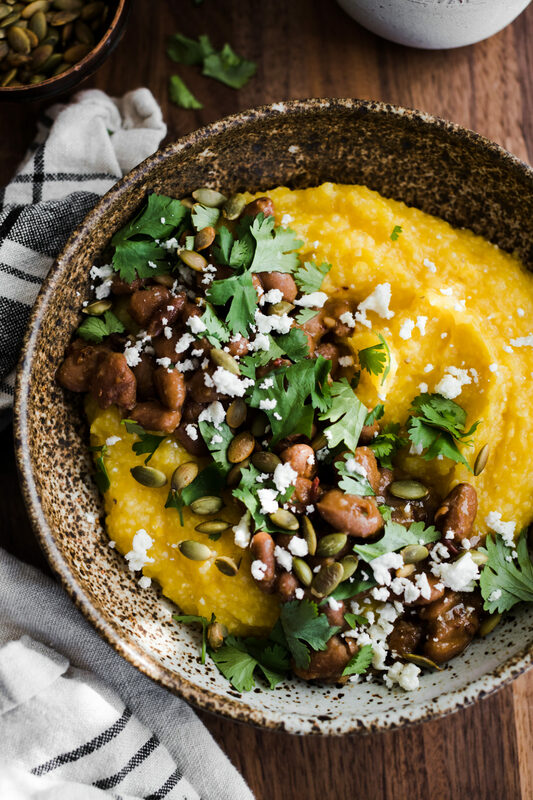 Divide the polenta into two bowls and top with beans along with the pepitas, cilantro, and feta (optional).